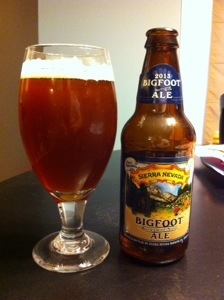 Sierra Nevada is one of the original American craft brewers. Located in Chico, California, they have been at the forefront of the craft beer revolution in the US. Founded in 1979 by Ken Grossman, they continue to blaze a trail for craft brewers around the world. Deep amber with a thin, but creamy tan head. A bit cloudy/hazy. Sweet with citrus note. No alcohol to speak of even know its more than 9%. Toffee and caramel. Sweet malt and caramel with the balance towards the hop bitterness. Hops, but no more then I was expecting. Citrus, resin, grapefruit. Some alcohol notes. Medium-full body with a moderate carbonation. You probably wont drink many of these in a row (or you may fall over – be warned), but very good. Aged a bit since the first bottle I had and the hops have faded a bit (this bottle is 6 month a drinking time). Better as it warms slightly. Though the hops are fading, its not becoming overly sweet and it still very drinkable. It should continue to age well for a long time.